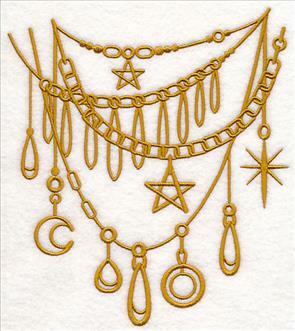 Arrows, goldwork, paisley, and more -- add new bohemian chic designs to your projects for a fun and artsy look! 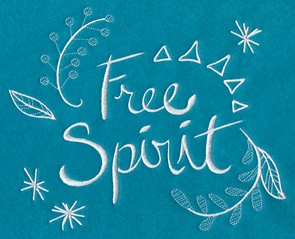 This week's designs feature the classic style of creative boho chic art, and are terrific for updating apparel, home decor, and more! 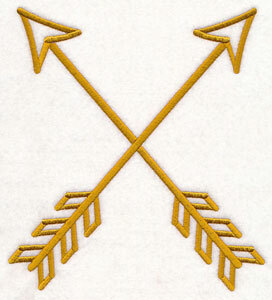 Frame a trio of colorful arrows, or update your wardrobe with goldwork, whitework typography, and lace headbands! 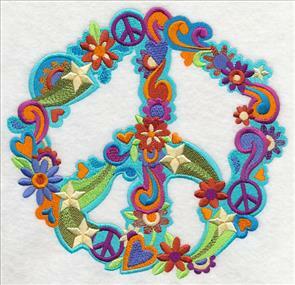 Plus, Flower Power baby animals, peace signs, paisley designs, feathers, and more! 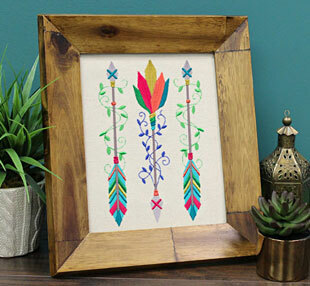 Frame your favorite designs to add the classic bohemian style to your decor. 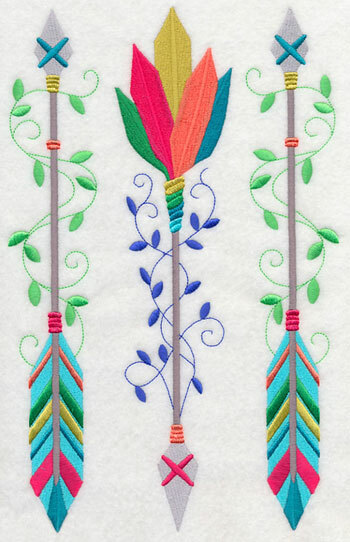 A trio of colorful arrows are the perfect way to set your sights on beautiful embroidery! Bright feathers, swirling vines, and more make this design a pretty embellishment for throw pillows, framed artwork, and more. 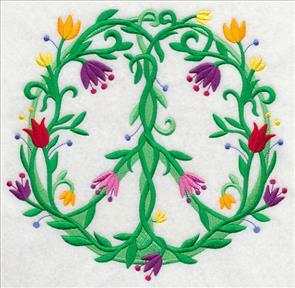 6.90" x 10.80" and 5.85" x 9.16" and 4.99" x 7.81" and 4.37" x 6.84" and 2.46" x 3.87"
Spread peace and love with your embroidery thanks to these creative designs! 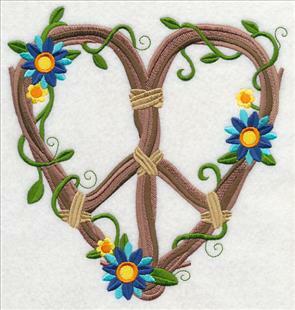 The peace sign on the left is adorned with blooms and vines, and perfect for garden and home decor. Add the colorful version on the right to gifts for teens, kids, and more. 7.78" x 7.47" and 7.04" x 6.76"
6.12" x 5.88" and 5.06" x 4.86"
7.81" x 7.40" and 6.88" x 6.52"
6.20" x 5.88" and 5.14" x 4.87"
A third peace sign made out of branches is adorned with bright flowers and vines for a rustic look. 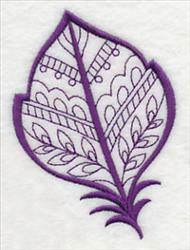 Stitch this lovely design on pillows, tote bags, wall hangings, and more! 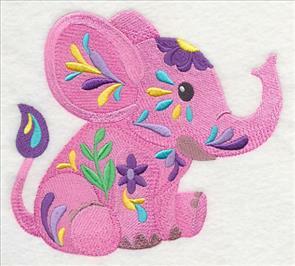 7.43" x 7.80" and 6.70" x 7.02" and 5.87" x 6.15" and 4.85" x 5.09" and 3.69" x 3.87"
Sweet baby animals will charm their way onto a wide variety of embroidery projects. Colorful swirls, flowers, and details give these animals an extra-adorable look. 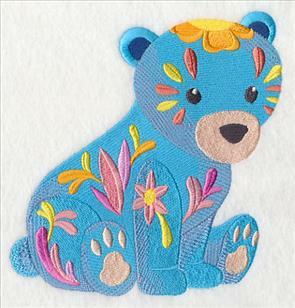 5.51" x 6.30" and 4.57" x 5.22" and 3.38" x 3.87"
Whether you're stitching a safari-theme quilt, or a wild and woodsy wall hanging, the cute-as-a-button flower pals will bring a colorful look to any project. 6.56" x 5.86" and 5.43" x 4.85" and 3.86" x 3.44"
These designs were inspired by the existing Flower Power animals, and are perfect to stitch in conjunction with one another. 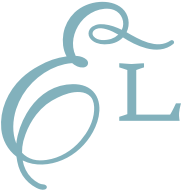 Use for nursery gear, kids' apparel, and more! 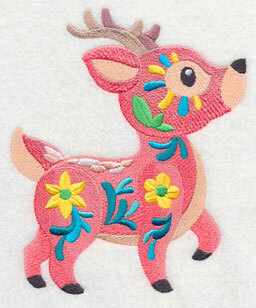 5.56" x 6.72" and 4.61" x 5.56" and 3.20" x 3.85"
Nine different wild animals -- an owl, raccoon, lion, elephant, bear, deer, quetzal, llama, and horse -- are available in this sweet style, and perfect for your next project. 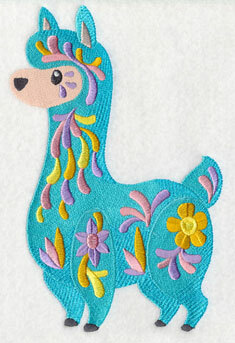 Stitch the llama on a pillow, or add the horse to a Western-inspired tote! 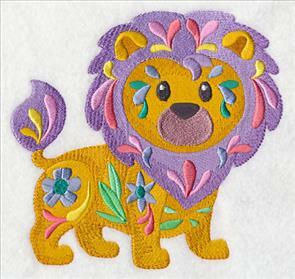 5.34" x 8.14" and 4.42" x 6.73" and 2.53" x 3.86"
Use all nine of the baby animals together, or pick your favorite to stitch alone. 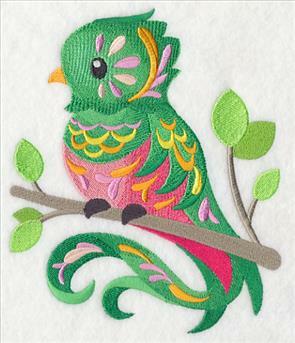 They're bright and colorful additions to a wide variety of projects! 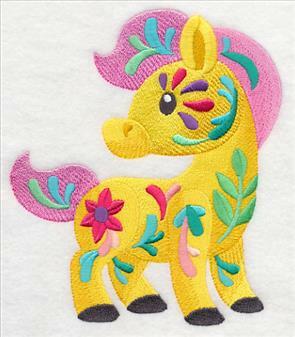 5.69" x 6.63" and 4.71" x 5.49" and 3.31" x 3.86"
These flower power animals are adorned with bright flowers and graceful swirls. Pick your favorites using the links above, or get them all in a design pack. 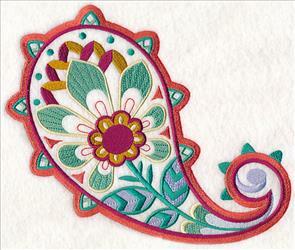 Give home decor projects a fabulous update with gorgeous paisley designs. 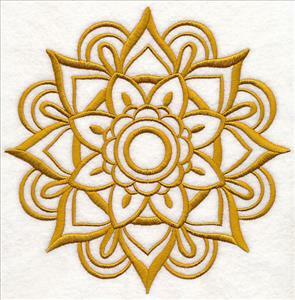 Add this intricate medallion to pillows, placemats, or quilts! 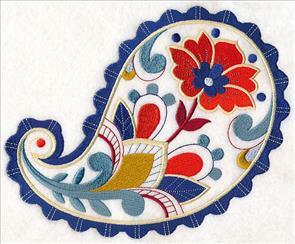 7.80" x 7.77" and 6.88" x 6.85" and 5.87" x 5.85" and 4.85" x 4.83" and 3.85" x 3.83"
Detailed single paisleys are perfect for updating a towel, or embellishing a table setting. The designs feature light, open areas, perfect for solid colors to show through. 7.78" x 7.45" and 7.01" x 6.71"
7.81" x 7.31" and 7.33" x 6.86"
6.26" x 5.86" and 5.19" x 4.86"
A spray featuring paisleys, flowers, and more is a terrific way to update the back of a denim jacket, or accent a quilt. 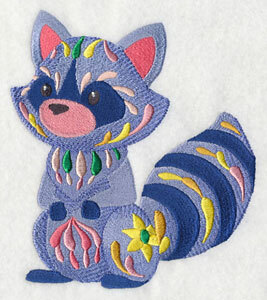 Stitch in your favorite colors for a personalized look. 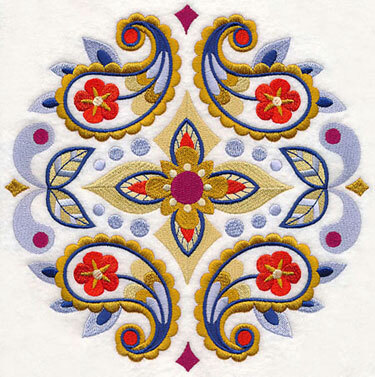 5.34" x 11.00" and 4.55" x 9.37" and 3.79" x 7.79" and 3.33" x 6.85" and 1.90" x 3.88"
Embroider these stunning designs on your next project for a beautiful burst of bohemian chic style. 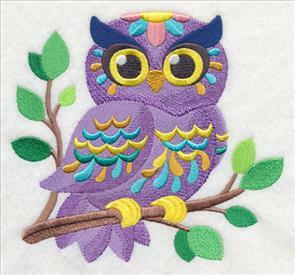 Stitch just once, or mirror and repeat four times to create a big embellishment on pillows, totes, and more. 8.25" x 6.86" and 7.59" x 6.31"
7.05" x 5.86" and 5.85" x 4.86"
8.14" x 6.86" and 7.49" x 6.31"
6.95" x 5.86" and 5.77" x 4.86"
These swirling, whirling paisley designs are perfect for linens, pillows, and totes. Get yours using the links above, or buy them all in a design pack. 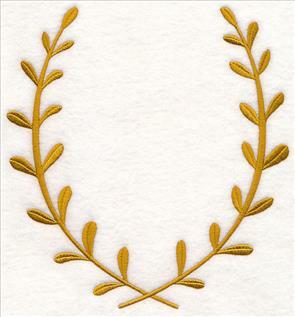 Bohemian chic fashion and home decor trends are known for featuring lots of gold accents and accessories. 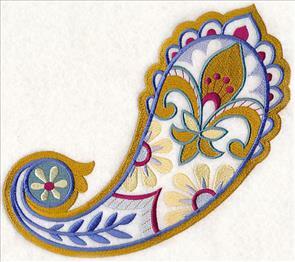 Stitch these traditional boho elements on your garments, decor projects, and more for a glamorous look in your life. 7.12" x 7.81" and 6.51" x 7.14"
5.86" x 6.42" and 4.85" x 5.32"
Use these shimmering designs to add a bright look to your home. 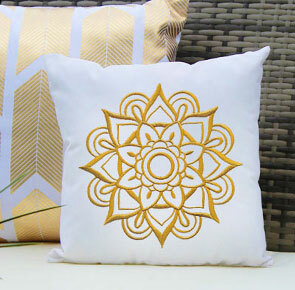 Here the mandala is used on an outdoor pillow -- they're also terrific additions to the living room, bedroom, or anywhere else in your home! 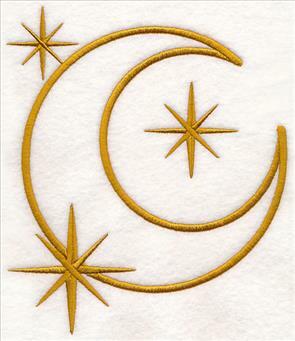 Stitch on pillows, tote bags, placemats, apparel, and more for a rich, gold look. 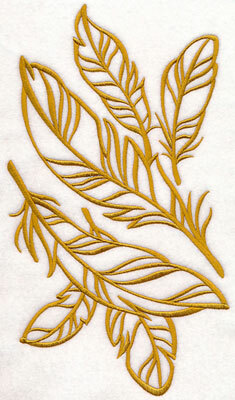 These designs are stitched in a striking gold color -- add an even more sparkly finish with metallic thread! 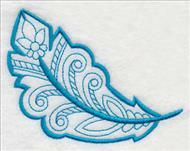 Find our best tips and tricks for embroidering with metallic thread here. 7.38" x 7.81" and 6.51" x 6.89"
6.59" x 11.74" and 5.28" x 9.40"
4.38" x 7.81" and 3.86" x 6.87"
Pillows, T-shirts, placemats, wall hangings, and more are the perfect place for these designs to shine. Add one to your next project! 6.74" x 7.81" and 6.21" x 7.19"
5.51" x 6.38" and 4.86" x 5.62"
6.90" x 7.78" and 6.31" x 7.12"
5.86" x 6.61" and 4.81" x 5.42"
Add a gilded effect to your projects with these boho chic designs. Purchase them individually using the links above, or get them all in a design pack. 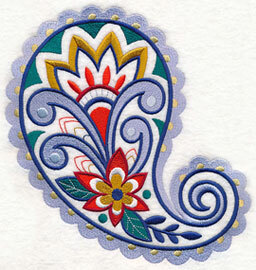 Mehndi artwork, a form of Indian Hindu art, is most recognizable by its use of beautiful, in-depth detail and complex patterns. 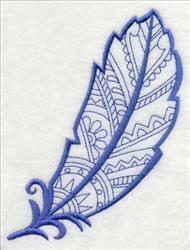 A collage of stunning feathers with detailed Mehndi accents is fabulous on pillows, tote bags, and more. 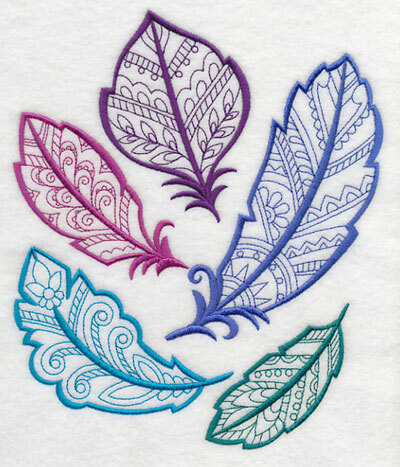 6.88" x 8.12" and 6.22" x 7.34" and 5.63" x 6.64" and 4.90" x 5.78"
Pick your favorite feather, then stitch it individually as a compliment to the medley above. 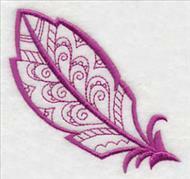 Or, use them all to make your own feather collage! 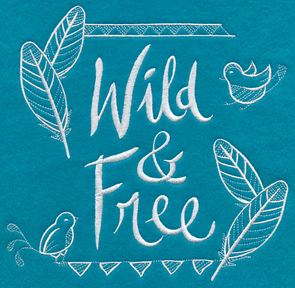 2.70" x 2.69" and 1.92" x 1.91"
4.08" x 5.31" and 2.90" x 3.77"
Beautiful whitework typography is the perfect design for anyone who is wild at heart. 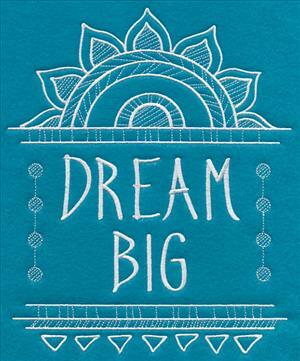 Great for bedroom decor, inspirational framed artwork, or T-shirt accents. 7.80" x 7.56" and 7.08" x 6.86"
6.05" x 5.86" and 5.06" x 4.90"
8.79" x 6.90" and 7.45" x 5.85"
6.18" x 4.85" and 3.87" x 3.03"
Any dreamer will love this chic design added to a pillow, embroidered on a tote bag, or added to a colorful tea towel. A great gift idea for teens, friends, and family! 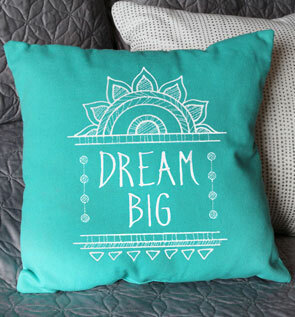 6.90" x 8.42" and 5.85" x 7.15"
4.85" x 5.93" and 3.16" x 3.88"
A colored pillow is a great place to show off these whitework phrases. 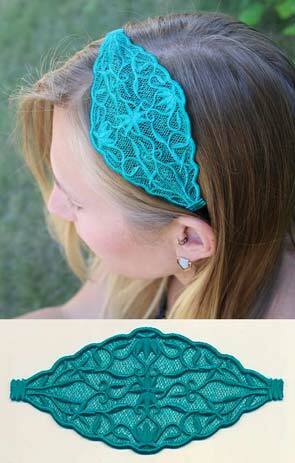 Headbands adorned with intricate freestanding lace are striking additions to any wardrobe! The do-it-yourself accessories are sure to add a stylish update to any outfit. 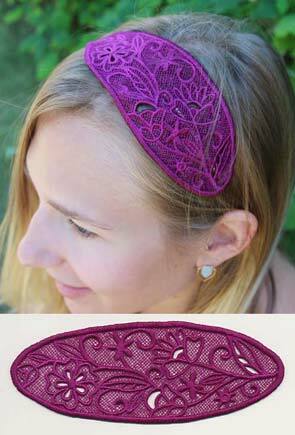 Find instructions for stitching and assembling the lace headbands here. 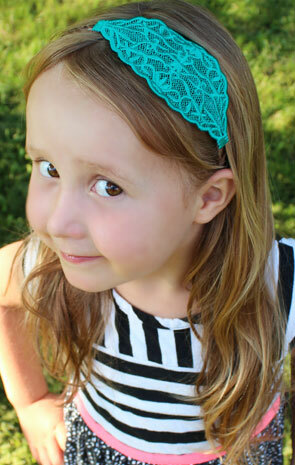 6.87" x 3.28" and 5.52" x 2.64"
Make a headband using the larger size for yourself, and the smaller size for your favorite little one! 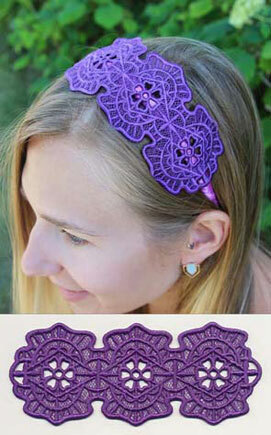 Three different styles of the headbands are available, and are terrific gifts for any fashionista. 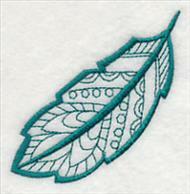 Stitch in a color to match your favorite garments! 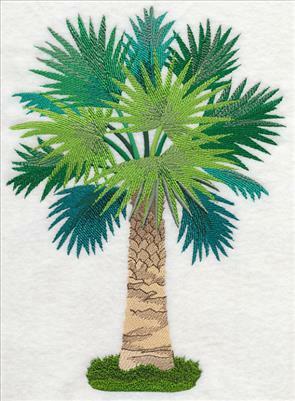 6.90" x 2.83" and 5.51" x 2.26"
Margaret, Pam, and many others have requested new designs featuring the palmetto and palm tree to embroider on their projects. 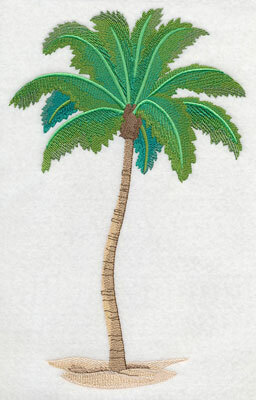 These tropical trees are terrific for beach gear, framed artwork, and more! 4.89" x 7.80" and 4.29" x 6.85"